Genre: Cute high school girl showcase lineup, light drama. Also Recommended: Is The Order a Rabbit?, Mashiroiro Symphony. Notes: Based on a smartphone dating simulator, where you can apparently court a hundred different girls. (Presumably not all of them at the same time.) There is also a couple of different manga being printed in ASCII Media Works's Dengeki Maoh magazine. An insight in the lives of girls attending an unnamed high school, clubs and whatever else happens outside it. It's not going to be easy to find something to write about when it comes to Girl Friend BETA. When I read about the anime centered around a dating game, I had to see what it was all about. Years before the game entered the equation, I can still remember the things I read about another, presumably similar, game called Love Plus, which apparently mixed real backgrounds with artificial girls, and you were actually expected to take them -- and by that extent, your Nintendo DS -- out on actual dates among other people, and it takes a very special kind of courage to do that. 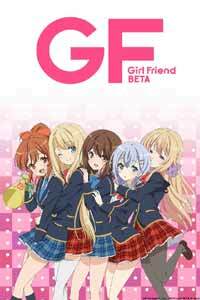 Now, whether it is a similar kind of game or not, the anime version of Girl Friend BETA has chosen to dispense with any kind of male lead and turn the thing into more of a slice-of-life kind of a show -- all the better to let the viewer fantasize about figuring out their future waifus with, I guess. I don't know for sure if the anime features all 100 girls, nor do I really care. The girls in here tend to subscribe to the MOE arcetypes with gusto. They're all so cute, airheaded, wholesome and inoffensive that it becomes almost irritating to watch them flit about and hear them when they open their mouths. There are no shrill voices in Girl Friend BETA. They're all as soft and fluffy as their character designs indicate. We even have "token blonde foreign girl with the weird accent", in this case Chloe, a girl from France who keeps using "oui" and "non" whenever applicable. She sounded so much like Kate from Sketchbook ~Full Color's~ that I thought she was American at first. In a way, I once again almost have to respect a show that knows its target audience so well. For my... well, complaints... about it earlier, there are people out there who swallow up this stuff for breakfast, second breakfast, lunch, elevensies and so forth, and if any of you are reading this, this show was made for you. It's almost impressive how into the most basic and insipid things the show will throw itself into with sparkling eyes, and the dialogue matches it. Most of the internal dialogue, and there is almost always internal dialogue, is rather boring and self-satisfying. And so, once the introductory episode is done, each episode from that point forth will systematically go through a plot centered around a group of girls and either their hobby or their club. And if not that, there is an episode centered around dieting, or what must be a favorite episode arc among emotionally manipulative ones; finding a group of abandoned kitties new homes. I got a bit nervous when we got to the girls who run a music club of sorts, because the intro and ending themes used for this show are terrible! Thankfully, their song wasn't nearly as bad as that. It was a bit bland and cranked out a few of those nonsensical encouraging metaphors about flying and whatnot, but it wasn't too shabby. And yes, like I said; there is an episode centered around diets, as I'm sure most girls fret about that sort of thing. (Just imagine me rolling my eyes here.) I remember Maoyu doing the tasteless thing where they have a really pretty woman stretch her arm skin and fret about getting fat, and I guess I shouldn't be too surprised about it happening here too. On a more positive note, said episode also showcased the first of those occasions when the show had it in itself to actually be funny, as shown by Chloe's line: "Hmph! Japanese girls just don't understand the joys of being soft and squishy!" Which is rich, seeing as the creators of this show seems to be forgetting that Chloe is from the country that gave us Twiggy. Even beyond that, Girl Friend BETA will occasionally go into scenes that descend below the kiddie-pool depth of social interaction the show normally has, and that's another thing to be grateful about. More often than not, it's too busy patting itself on the back about the most banal of things, so occasions like these are certainly appreciated. For what it's worth, I do think the characters look nice. Most of them are unusually curvy for high schoolers, but we can attribute that to its cartoonish style, the MOE thing and the technicolor selection of hair colors. It's an easy show to fall in love with if you're into that sort of thing. The show is kind of weird in that the girls doing sports tend to be the fluffier ones, while the ones who do more sedate hobbies are thinner, which makes no sense at all. In fact, Shiina -- the girl the diet episode is centered around -- is a gymnastics athlete who is aiming for the nationals, yet she's approaching Super Sonico levels of curvature. Visually, the show is... adequate. Like I mentioned, the characters generally look nice, but on a technical level, the show is strangely pedestrian. The lineart for the girls are weirdly thick and consistent, and the animation, especially during the more active moments -- like the aforementioned gymnastics scene -- gets weirdly choppy, even if it seems like it's staged well. But more often than not, the girls are just standing around talking to each other, so it's a bit hard to tell. It's probably giving its all with a miniscule budget, so props for trying, at least. The main problem about Girl Friend BETA is that it's not really treading any new ground. Most of the episodes are centered around plots that has already been used in other shows, so it feels kind of lazy in that regard. Super Sonico at least had episodes that allowed her to get away from all that, and those were the most rewarding episodes of all. Girl Friend BETA wants to come across as appealing, but I often fell into the habit of tuning out the girls' mindless droning about this and that and just stared at the show itself, which is kind of unnerving when you think about it. That said, the show is probably harmless, so if you can find the patience to hang on to every word they say, you might like this show. Maybe. Recommended Audience: From a fanservice perspective, the show is completely, utterly harmless. While a lot of the girls have been generously provided for by the onset of puberty, there is never any scenes with them bouncing around or heaving about. I have never played the game this show is based on, but the show makes me utterly convinced that it's just as harmless. Girl Friend BETA © 2014 Silver Link, C-station.